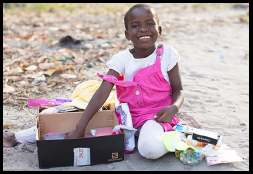 Thank you to all who filled boxes as part of our Operation Christmas Child Mission. We had a total of 76 boxes returned filled for boys and girls of various ages. Twelve of the boxes were filled by the Sunday School children. We requested to track our box and it would appear that our boxes had a final destination of the Dominican Republic. Many children of the Dominican Republic had a very Merry Christmas. Praise God.